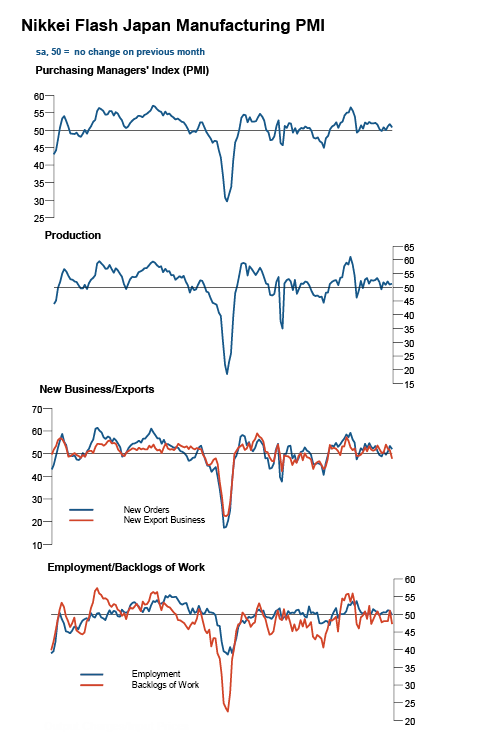 Japan's Manufacturing PMI is still growing, but barely. 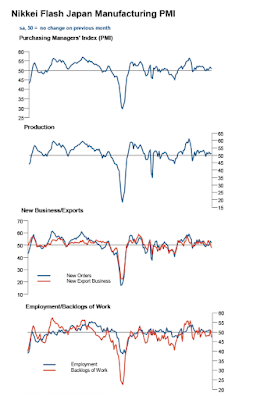 Flash Japan Manufacturing PMI™ at 50.9 (51.7 in August). Operating conditions improve at slower rate. Flash Japan Manufacturing Output Index at 51.4 (51.1 in August). Growth in production little changed from August’s modest pace. Amy Brownbill, economist at Markit, which compiles the survey, said: "September PMI data pointed to a general slowdown in the expansion of the Japanese manufacturing sector. New order growth moderated, having increased in August at the fastest rate since January. Underpinning the slowdown in total new order growth was a sharp reduction in international demand as new export orders dropped to the greatest extent for 31 months. A number of panelists blamed a fall in sales volumes from China leading to a decrease in new exports. Subsequently, employment levels declined for the first time since March." Japan is clearly treading water here as 50 is the break-even rate. Right now it looks like China will pull Japan down with it. And what about prices? Both input and output prices are back in negative territory. Wasn't Abenomics supposed to cure that problem? Indeed it was, not that it posed any real problem though. The only problem is going into debt to fight deflation. All you get out of it is more debt.